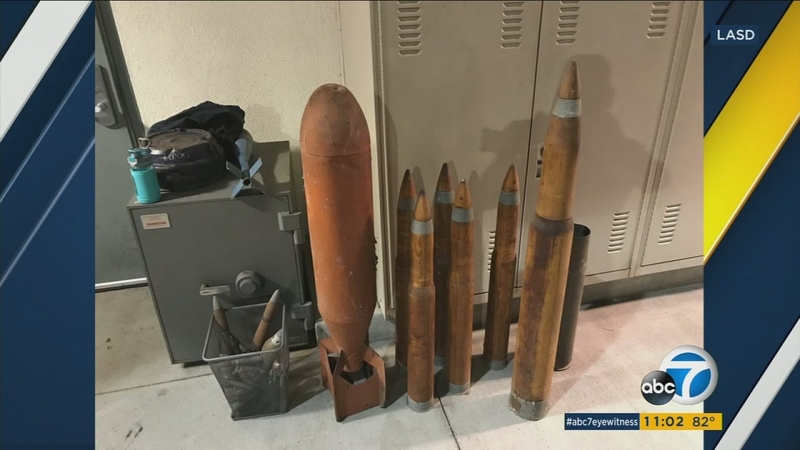 LAWNDALE, Calif. -- Homes in Lawndale were evacuated for hours after a cache of military explosives was found in a backyard of a house. Los Angeles County sheriff's deputies responded to a call of a suspicious car at a home near Avis and Prairie avenues sometime after 11 p.m. Thursday. Investigators found well over a dozen military ordnances, a basket full of grenades and large artillery shells, some several feet long, in the backyard of the home. The weapons appeared to be very old, possibly from the World War II era, officials said. Surrounding homes were evacuated to Leuzinger High School after officials made the discovery. The evacuated areas were one block east and one block west of Avis Avenue between 147th Street and 149th Street. "They told us, 'Hey, there's a bomb threat, you guys have to evacuate immediately. Pick up whatever you need, the most important things: medication, blankets and just leave,'" explained Lawndale resident Tony Bernaba. Bomb technicians from an arson explosives detail team later determined most of the devices were duds and couldn't do harm, but others were in fact active. LASD officials said one person was arrested at the scene. He's described as being a parolee who was found with a gun he told deputies he got from the home. Officials were investigating whether the home was otherwise vacant and occupied by transients. Neighbors said a man who once lived at the home wore military clothing, but it was unclear whether he was a veteran. They added that they thought the home was empty after the man passed away a few months ago. "That's terrifying, you know, just knowing that everyone around there wasn't safe at that particular time," Bernaba added. "There's something that could have gone off, we could have all been hurt and, you know, no one knew about it." Investigators said they were discovering more military ordnances from a shed in the home's backyard late Friday morning. By around 2:30 p.m., the scene was cleared and evacuations were lifted. Anyone with information about the home was encouraged to contact the Los Angeles County Sheriff's Department's Arson/Explosives Detail of the Special Enforcement Bureau at (323) 881-7500. If you wish to remain anonymous, call "LA Crime Stoppers" by dialing 800-222-TIPS (8477).